Don’t trust the yeti? Here are the highlights of some other “2017 best game of the year” lists. Do you have quetions, or want a specific recommendation? Don’t hesitate to contact me on twitter or drop me a line. Mansions of Madness: Second Edition and Imperial Assault. Don’t trust the yeti? Here are the highlights of some other “2015 best game of the year” lists. Need additional info, or want a more specific recommendation? Don’t hesitate to drop me a line or @ me on Twitter. Two-Player: Wir sind das Volk! Need additional info, or want a more specific recommendation? Don’t hesitate to drop me a line. The 2015 Make-Yer-Own Oscars Pool Page is live. Per tradition there has been exactly zero user testing, so let me know if you encounter bugs, typos, or miscellaneous weirdness. It’s often difficult to whittle the selections down to 10, but this year was especially tough. Here are five more that were on the list at one time or another, but eventually pushed below the fold. This year marks the tenth anniversary of the Good Gift Game Guide’s publication in The Morning News. Not all of the selections over the last decade have withstood the test of time, but here are 20 that hold up (and are still available) today. @matthewbaldwin My husband @gkr and I want to Skype and drink while playing a board or card game with some East Coast geekfriends. Any recs? Hmm, that’s an interesting challenge. I’m sure I could search Google and find some board games that are routinely played via Skype, but let me ruminate on the problem a bit first. How could this be done? I’ll think this through using Monopoly as an example. One party (A) would set up the board and position the camera such that the other party (B) could see it; Party A would also be in charge of moving the pieces and placing houses/hotels onto the board. Party B would roll their own dice, take deeds from their own set when purchasing property, and use their own bank. When money was transferred from a player in one party to a player in the other, the debtor would return the sum to their bank and the creditor would take an equivalent amount from theirs. When a player in Party B landed on a Chance or Community Chest space, a player in Party A would draw the card on his behalf and read it aloud. As near as I can tell, Monopoly would work without requiring any modification to the game rules. 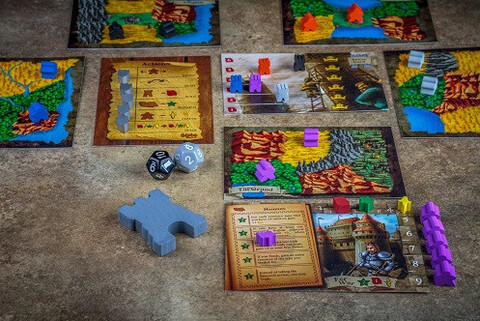 So would Carcassonne, if someone in Party A revealed tiles on behalf of the players in Party B and placed them (along with the associated meeples) in accordance with the wishes of the active players. Viewing the board might be a pain for players in Party B, but it’s doable. The common denominator in the games above is the lack of hidden information. The problem comes when players draw items (such as cards) from a common pool (such as a deck), and these items are meant to be kept secret. Hence the exclusion of Settlers of Catan from the list above (development cards), and the main version of Agricola (Occupation and Minor Improvement cards). To see why this is an issue let’s examine Scrabble, where each player has their own set of hidden tiles. Here again Party A could be in charge of the board, placing tiles onto the spaces dictated to them by the players in Party B. But from where does a player in Party B draw to refill his hand? If each party the tiles in their copy of the game, it messes up the distribution: you have twice as many Z’s etc., and you’ll have to play twice as long before you run out of tiles. If you only use one pool, and there are at least two players in each party, I can’t think of an easy way for a player in Party A to draw tiles on behalf of someone in Party B and communicate that information to them whilst keeping in secret from himself and others. Given all this, the ideal game for playing over Skype would seem to be one without a central board, or common pool from which hidden items are taken. 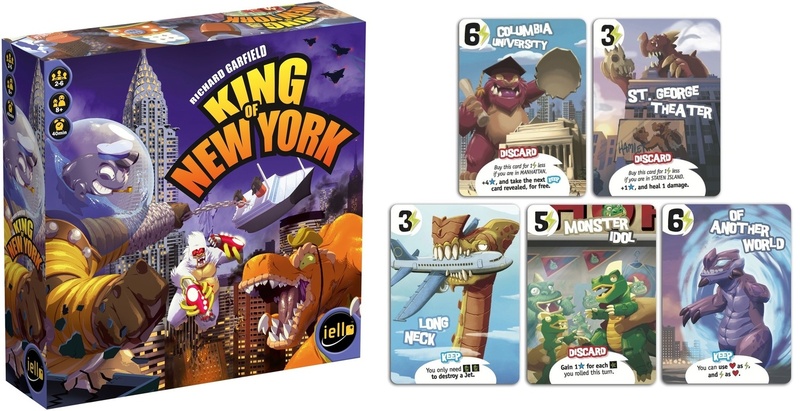 Dice games leap to mind, such as Roll Through the Ages, Dungeon Roll, and King of Tokyo (the superfluous board of which could be replaced by simply putting the in-Tokyo monsters in front of the camera). Another category would be games in which each person plays from his own deck of cards. Dominion almost works (but when a player in one party bought a card, the other party would have to trash an identical card), as does Sentinels of the Multiverse (although the Villain and Environment decks are a “central board” of sorts). Sentinels is also cooperative, which simplifies some aspects of playing over Skype. Other co-ops that should work well include Forbidden Island and Forbidden Desert, Flash Point: Fire Rescue, and Elder Sign. P.s. After posting I allowed myself to Google this topic, and there are fewer suggestions out there than I had anticipated. Most recommend playing via V.A.S.S.E.L. or similar service that mediates the game, with Skype there to facilitate the social aspect. Based on the success of the first one, the Seattle Gamenight / Tweetup has officially become A Thing, and will henceforth be held on the last Friday of each month. For the next, February 28, I have reserved a room at Cafe Mox, Seattle’s premiere game parlour. The space only holds 10, so please RSVP via Twitter or email if you intend to join; if we get > 10, we will relocate. On March 28 we are back at The Elysian, for a gamenight featuring Special Guest Star @ansate. Yay! And a week later, Saturday April 5th, it is International Tabletop Day. I have no plans as of yet, but will cook up something in observation of the event. Stay tuned. The 2014 Make-Yer-Own Oscars Pool Page is live. Per tradition there has been exactly zero user testing, so let me know if you encounter bugs, typos, or miscellaneous weirdness. Plus: The Resistance, Love Letter, King of Tokyo, and your requests. Come to play, or just say hello. The 2013 Good Gift Games guide appears in The Morning News today. Kind of a strange list this year, populated almost exclusively with card games. 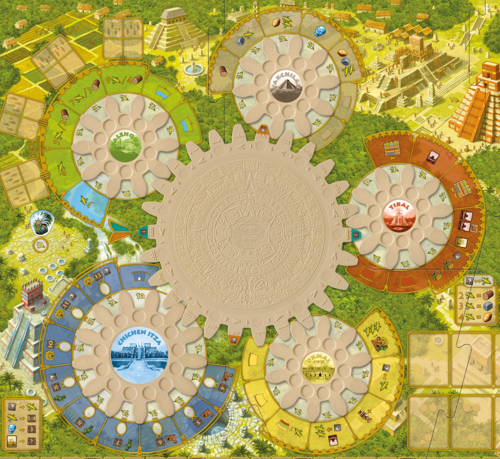 The only games with traditional boards are VivaJava and Eight-Minute Empire (albeit one the size of a large index card). There also no games exclusively for two-players. I was originally going to include Agricola: All Creatures Big and Small (see below), but ultimately omitted it from the main list for the crime of Excessive Dryness. Eight-Minute Empire PDF Appears to be out of stock everywhere, but the sequel, Eight-Minute Empire: Legends, will be released on 12/09 according to Amazon and Funagain. See also: the Good Gift Games Greatest Hits (although I need to update it with King of Tokyo, Cards Against Humanity, Love Letter, and Lords of Waterdeep). The Good Gift Games guide focuses on games that are “easy to learn and teach, fun and engrossing to play, and that can be completed in 90 minutes or less”. I like games that meet these criteria of course, but also enjoy the meatier stuff. Here are five of my favorite mid- to advanced-strategy games of last year or so.